Jaipur, 10 December: The second day of the ongoing ‘Thirak Utsav’ at JKK witnessed a symposium, master classes as well as scintillating dance performances today. The day commenced with a symposium on ‘Jaipur Gharana of Kathak’ in which Pt. Charan Girdhar Chand from Singapore who will be spoke on ‘Contribution of Guru Narayan Prasad Ji’; Pt. Rajendra Gangani from New Delhi on ‘Contribution of Guru Kundanlal Gangani’; Guru Geetanjali Lal from New Delhi on ‘Contribution of Guru Devilal & Guru Durgalal ’; and Guru Pt. Girdhari Maharaj on ‘Contribution of Guru Pt. Laxminarayan’. Guru Prerana Shrimali from New Delhi moderated the session. 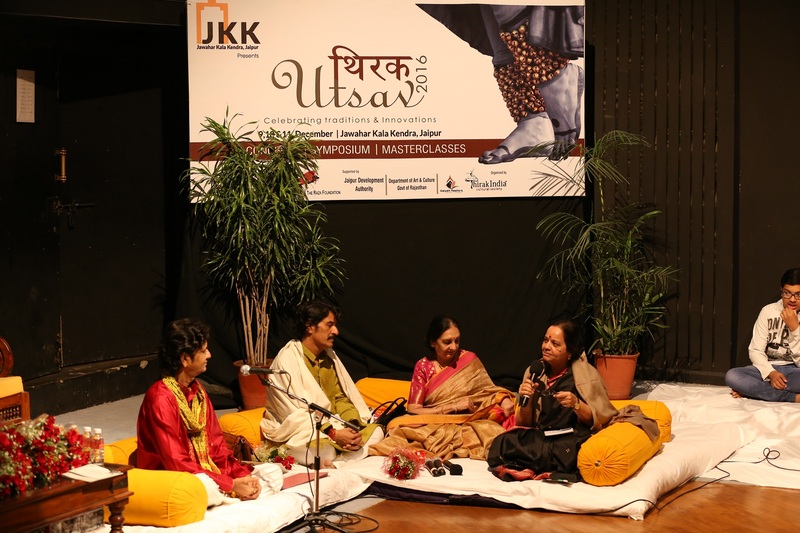 Three master classes were conducted at Krishnayan Auditorium by Pandit Rajendra Gangani and Guru Geetanjali Lal from New Delhi as well as Pt. Charan Girdhar Chand from Singapore. Later in the evening JKK’s Rangayan Auditorium witnessed a scintillating Odissi dance performance by Mr. Saswat Joshi. The theme of his performance today was a confluence of ‘Male’ and ‘Female’. He started his performance with the ‘Sabha Pranam’ in three parts — one to lord Jaganath Swami, second to the his guru Ileana Citaristi and third to the audience. He presented ‘Raag Shankara Vandanam’ followed by the presentation of the nine avtars of Durga (‘Nav Durga’). He was accompanied by Praful on Pakhawaj, Dheeraj Pandit on flute and Prashant on vocals. This was followed by a mesmerizing Kathak dance by Ms. Prerana Shrimali at Rangayan Auditorium. Her performance was themed on the history of kathak from Braj Bhasha to Urdu. She presented her dance on Govind Swami’s Pad — ‘Nir Tat Gopal Sang’. She also performed on the Sharad Poornima Raag as well as different presentations of Jaipur Gharana of Kathak. She was accompanied by Fateh Singh on Tabla, Imran Khan on vocals and Pandit Harihar Sharan Bhatt on Sitar. It is noteworthy that Saswat Joshi is an internationally acclaimed Odissi dancer and choreographer. He is also the brand ambassador of Odisha Tourism for promoting Odissi culture throughout the world. Prerna Shrimali is amongst the top leading Kathak dancers of India. She has received training from Guru Shri Kundanlal Gangani of Jaipur Gharana. A versatile dancer, she has evolved an individual style in her presentation and gained wide popularity as a soloist. She has explored the varied poetry of Kalidas, Meera, Kabir, Ghalib as well as the French poet Yves Bonnefoy through her performances.